Background Healthcare professionals working in acute settings lack education and training in dementia care, resulting in people living with dementia receiving a reduced quality of care. 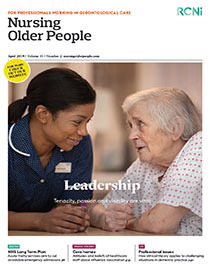 Discourses are ways of communicating through written and spoken language, and healthcare professionals often adopt ageist discourses when constructing the identities of people living with dementia. Aim To explore how healthcare professionals working in acute settings construct the identities of people living with dementia. Method Semi-structured interviews were conducted with nine participants working in acute settings in the Republic of Ireland. Findings Participants adopted two main discourse areas to construct the identities of people with dementia. The first discourse area related to the act of caring and the second discourse area, described as ‘identity discourses’, centred on the everyday language used by healthcare professionals. While participants strived to be person-centred the culture of acute settings was often task orientated. Conclusion Caring for people with dementia is challenging in the acute healthcare setting. There is a need for ongoing training and effective continuing professional development strategies.